This mob spawns at +530, -1455, -112 northwest of the northern East Freeport zone line. Not available during Kunark on progression servers. Available during Velious progression servers. Out of era spells are filtered out. This page last modified 2018-08-07 15:04:34. Here is the merchant listing during Velious on Agnarr. She isn't yet in the game with Luclin. Easier way to find her? I think the easiest way to find her is to do a find on Krystin Charcoal. 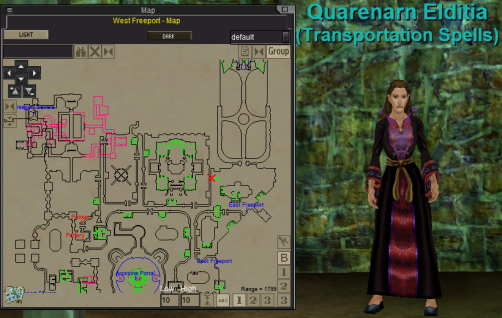 Quarenarn Elditia is Northwest of Kyrstin, standing next to 2 other vendors (who, like Quarenarn, are not in Find). Oh and yes, she's now on the Combine Server. She comes up when PoP comes up. Thank you! That made finding her very easy. -Tell me, do you ever stop bulling and shouting at the lower orders? -Nope! There is only one way to run a campaign! Shout shout and shout again! -You don't think then, that inspired leadership and tactical ability have anything to do with it? -Nope! its all down to shouting! Confirmed Easy's post....found her....she's a merchant under the awning. Use your maps from www.mapfiend.com to find her if you have a problem. She marked on the also. Quarenarn Elditia can be found in West FP @ LOC 531.27, -1462.22, -133.02...North East of Northern-most East FP zone shown on map. She comes equipped with a host of wiz/dru gate spells. Is it wrong to have fake barbarian boobies and a big surprise underneath my kilt? Not on the "Find" function and not in the wizard building from what I can find.